Below, I’m going to list out the top 10 finishers in each area. That’s a lot of data! How can you use it effectively? Let’s start with a few principles. Ideally, a balanced diet will draw from all of these categories, perhaps a bit more heavily from the fruits and vegetables and maybe the beans and whole grains categories, too, with a lesser amount coming from the other groups. You want to mix things up to get a balanced diet. Similarly, you’re going to want to mix things up within categories to ensure a varied diet, both for your nutrients and for your palate. Of course, at the same time, you want to spend less at the grocery store. What you can do is use this information along with the grocery store flyer to plan your meals for the week. Ideally, what you’ll try to do is focus on meals that are easy to prepare that are made up mostly of ingredients that are on those lists and also ingredients that are on sale. Let’s say we’re planning breakfasts for the week, for example. One thing you might notice from this list is that oatmeal is pretty cheap – it’s $0.09 per 100 calories for rolled oats and $0.12 for steel cut oats. That’s cheap. You’ll also notice that bananas ($0.21 per cup), apples ($0.28 per cup), and pears ($0.42 per cup) are all also pretty cheap and all work really well as an additive to oatmeal. So, for a couple days a week (at least), have a bowl of oatmeal for breakfast with a different fruit chopped up in it. You might also vary things by using whatever fruit is on sale that would go well in oatmeal (like peaches, for instance). You can have a cup of cooked steel cut oats with half a cup of chopped bananas in it for a roughly 325 calorie breakfast with a total cost of $0.34. You might also notice that eggs are cheap, at $0.19 per 100 calories. That’s a good food to have semi-regularly for breakfast. Bacon is similar, at $0.18 per 100 calories, and that makes for a reasonable occasional breakfast food, too. Two strips of bacon and two eggs is roughly 300 calories (depending on how you cook them) and the total cost is going to be about $0.55, for instance. What about lunch? You could have a small grilled chicken breast (250 calories, or about $1.25) and whatever vegetables you like along with it, adding about another quarter, or turn it into a sandwich with wheat bread for another quarter. Put a slice of cheese on it for about another 15 cents. Or, you could have a tuna salad by tossing a can of tuna (about $0.50) with a bit of olive oil (about $0.05) and a few seasonings (a penny or two) and mix it with a cup of spinach (about $0.50) or iceberg lettuce (about $0.25). You’re talking lunch for under a buck. For a snack, eat some peanuts or some fruit (like an orange) or have a piece of bread with some peanut butter on it. All of those are at most a quarter or two. Dinner offers you lots of options. Have a salmon fillet ($2 for a 300-calorie filet) or a turkey breast ($2 for a 300-calorie piece of turkey breast) with some veggies on the side ($0.25 a cup or so, depending on what you choose). Make a soup with some ground beef in it (maybe $2-$3 across a large pot of soup) and use lots of beans ($0.05 to $0.09 per 100 calories of beans, which means you can eat a LOT of beans) and save the leftovers. Make yourself a black bean burrito with a tortilla (maybe $0.25), lettuce (probably $0.10 for the amount you’d put on a huge burrito), onion ($0.05 for the amount you’d want on a big burrito), a bit of cheese (maybe $0.10), and a ton of beans (again, a few cents). Those are all dinner options for just a dollar or two, made up of stuff from the lists above, and there are many, many more options and combinations. The thing is, all of these examples come from just options on those lists. If you use your grocery store flyer and also include sale items where the prices on other items come down into this range, you add a lot of week-to-week variety here without adding much cost. These principles enable us to feed our entire family of five breakfast for about $2, lunch for about $3-$4, and dinner for about $5 if we’re careful. That’s a monthly food budget of about $300 for a family of five. Now, naturally, we do buy a lot of items not listed above and incorporate those into our diet, but we use the ingredients above as a default and use them as the basis for a lot of our meals. Oatmeal with fruit in it is a very common breakfast, as are eggs and a piece of whole wheat toast. We have very simple lunches all the time. We eat a lot of dishes with beans in them, including as side dishes in tons of meals. 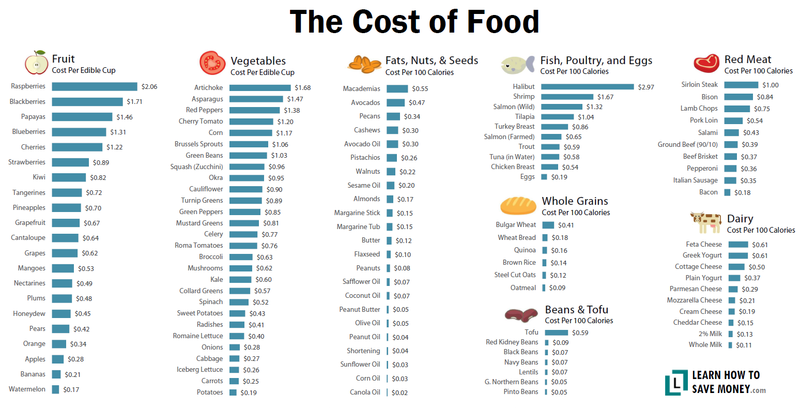 My challenge to you for reducing your food costs isn’t to make every meal cheap, but to make your ordinary meals cheap by sticking to ingredients from these lists and from your grocery store flyer. Make most of your meals using these cheap ingredients and your food expenses will be very cheap on the whole. That way, when you do splurge on other foods, you’ll still keep your overall food costs low for the month. By all means, enjoy a steak with your wife on a Saturday evening or go out for dinner with the family on Sunday or have a date night every once in a while. For the rest of your meals, though, keep them cheap and simple. Not only will you be healthier, your wallet will be, too.